The Firecracker Mile run got off to a good start with a record turn-out of approximately 469 runners. Last year there were only about 400 runners. 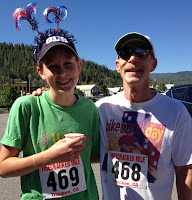 The race began promptly at 10:00am near US Bank on Donner Pass Road. The course followed the parade route past hundreds of spectators to the finish line at the Truckee Depot. The race was hotly contested by Truckee locals, Brandon Reiff and Alex Taylor. Reiff won with a time of 4:20, with Taylor on his heels with a time of 4:21. The first female, Tina Oprean from King’s Beach, stopped the clock at 5:00. I ran the race with the hope of getting what I consider a reasonable time. The course is down hill and essentially straight, so a personal best was possible. However, I went out to fast and had to slow down. I guess I forgot about the altitude here in Truckee. I checked out the results and saw that my posted time is 10 seconds faster than my watch time. I am OK with that. I’ll just assume I stopped my watch late. 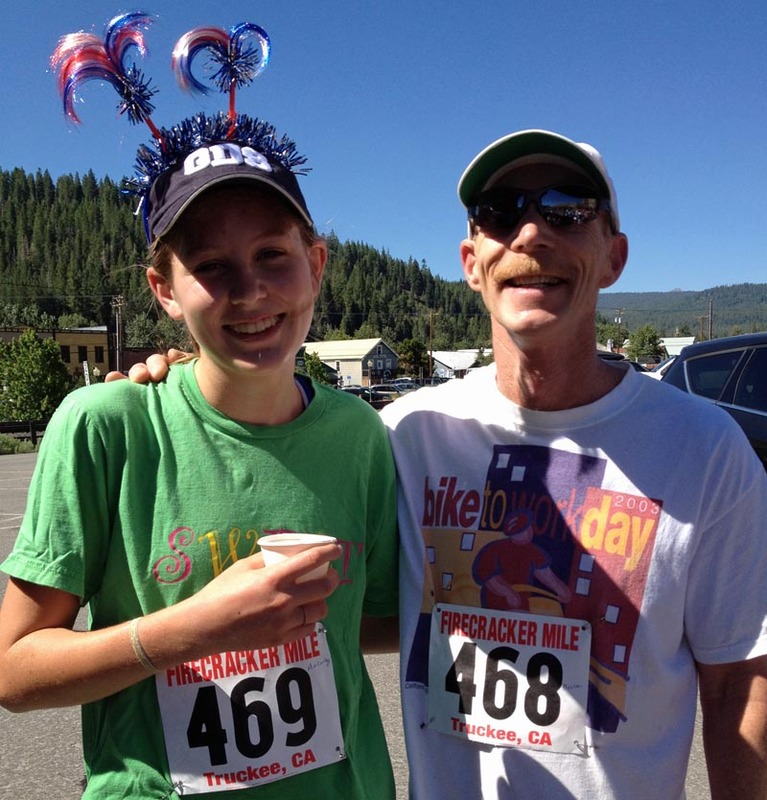 The Firecracker Mile is a fundraiser for the Auburn Ski Club. This run is always fun, inexpensive, and provides a timed distance for all abilities. 426 15 Andrew Chan M 46 Truckee ? 33 Lucy Demm F 8 Truckee ? 43 Tina Stull F 29 Truckee ? 44 Peter Stull M 19 Truckee ? 47 Chris LeFrak M 15 Truckee ? 60 Mary Schultz F 52 Truckee ? 111 Brad Dutton m 52 Olympic Valley ? 112 Madeline Dutton f 7 Olympic Valley ? 113 Ann Dutton f 45 Olympic Valley ? 116 Ted Norgard m 73 Truckee ? 137 Jake Foehner M 14 Pleasanton ? 169 Marley Martin F 19 Woodland ? 199 Takuto Saito M 3 Reno ? 240 Annika Taylor F 19 Truckee ? 246 Austin Bond M 42 Bethesda ? 252 Max Gordon M 8 Truckee ? 265 Maggie Vieira F 35 Dixon ? 268 Oliver Jobe M 10 Truckee ? 330 Andrew Corwin M 17 Sugar Land ? 333 Andrea Fisher F 19 Williamstown ? 334 Emily Blackmer F 22 Hopkinton ? 348 Alisha Mecier F 33 Eldorado Hills ? 391 John Novitsky M 54 Truckee ? 401? Sean Powers M 25 Truckee ?